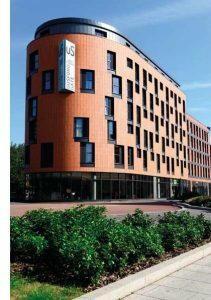 Student accommodation provider Unite’s latest development in Coventry has made use of voestalpine Metsec’s light gauge steel Metframe system to meet the project’s specific design and performance requirements. Unite operates over 125 sites across 25 key university cities and towns in the UK. The latest development on Far Gosford Street, known as Gosford Gate, will be home to 286 students and is a key part of a long-term regeneration program in the Coventry area. Led by main contractor Bowmer & Kirkland, the process of constructing a facility to host a large number of students within a restricted urban area was said to require the full design and engineering capabilities of Metsec. In addition to the logistical issues of working in a congested location, the complex design required a number of bespoke elements, to ensure that the framing solution accommodated the number of curves on the building. Metframe is a lightweight panelized solution, said to be ideal for medium-rise buildings. The panels are manufactured offsite and faceted around the curves on the building. The contractor said this precision engineering helped to avoid waste on-site, limit the cost to the customer as well as help to reduce the project’s overall environmental impact. Ryan Simmonds at Metsec commented: “When designing the framework, we had to consider both pitched and flat areas of the roof. Areas of the framework also needed to be faceted to accommodate the building’s curved corners. The use of BIM was crucial to ensure we could visualize the interfaces and ensure our teams would not face any issues on-site when it came to installation.